This weekend includes a massive arcade expo, a public star party at the Observatory, a free party at the La Brea Tar Pits, a free drawing class at the Getty Center, a Quiet Clubbing dance party, and plenty more to choose from. Yes it’s in Riverside but this three-day Arcade Expo will bring over 800 games, old-school and new-school in one place and hold tournaments, an auction, a sleep over and more! Quiet Clubbing is coming to Los Angeles and to celebrate they are throwing a launch party that involve three DJ’s playing live simultaneously, through frequencies only heard through headphones. Partyers can switch between channels to hear any DJ they want, at any given time. The headphones also glow to the color of the DJ that you switch to, so that you can see who else is listening to what you are. Get more information and discount tickets (just $5!!!) via Goldstar. Angel City Brewery has deemed January 15, from 2:00pm -8:00pm a (NO) Snow Day to give Angelenos a hall pass for a day of wintry amusement – L.A. style. Shop at the vendor market, grab a bite at a food truck, take advantage of the beer specials and live music. There’s even a screening of the 80s classic Gremlins at 4:00pm. The Public House will be open from 2:00pm – 1:00am, and will be decked out with falling snow projections throughout the beer hall, a crackling fake fireplace and old game shows on display. Each year MOMA hand picks a section of films from the last 12 month they believe will stand the test of time for their annual The Contenders series. Each screening also includes a conversation with the filmmaker. The series takes place at the Hammer from January 6-20. Tickets are $15. Eat Well Week kicks off January 11 to promote healthy eating in the New Year. In conjunction with California Restaurant Month, select Santa Monica restaurants will offer a dish highlighting California’s native vegetable, the artichoke. From grilled and fire roasted artichokes to ceviche, risotto and puree, restaurants will offer an assortment of artichoke delights throughout the city. Highlights include the newly opened Inotheke who will feauture a Lamb & Artichoke “Avolemono.” RawVolution offering a Raw Vegan Sweet Potato Puff stuffed with artichoke cream topped with cranberry chutney and Locando del Lago will feature Risotto con Carciofi e Burrata with organic carnaroli risotto, artichoke, buratta cheese and parmesan. Step into the world of Cirque du Soleil’s KURIOS a place of wonders where your imagination can alter reality. Interested? Get more information and discount tickets on select days this week via Goldstar! The critically acclaimed off-Broadway hit The Absolute Brightness of Leonard Pelkey, written by and starring James Lecesne, the writer of the Academy Award-winning film Trevor, will have a limited 23 performance engagement at the Kirk Douglas Theatre from January 13 to January 31, 2016. Watch veteran New York actor and writer James Lecesne as he portrays every character in a small Jersey shore town as they unravel the story a 14 year-old boy who goes missing. Recently awarded the United Solo Special Award as well as being a New York Times Critic’s Pick, this is a show not to be missed. Get more information and discount tickets via Goldstar. La Brea Tar Pits and Museum and 5 Everyday present It’s the Pit’s! A “creative salon” where artists, musicians and filmmakers all converge for a late-night, science and arts party. Expect screens of science and animation films; Tom Carroll leading guided tours; a site-specific dance piece; a string quartet and Dublab DJs spinning tunes. RSVP’s to this free event is maxed out online but they announced a limited number of non-RVSP’d guests will be let in at the door. What happens when a classic Shakespearean story gets merged with a soundtrack by Pat Benatar? A highly entertaining dinner theater show at the Rockwell in Los Feliz starring Family star Ashley Argota (The Fosters) as Juliet and handsome Corbin Bleu (High School Musical) as Romeo. Get more information and discount tickets via Goldstar. From January 10-15 the city of Pasadena along with 40 participating restaurants, bars, pubs, and lounges will offer specials on cheeseburgers in celebration of Cheeseburger Week. We spotted an awesome deal over at Otus Thai Kitchen on La Brea. As seen on their Instagram, they are trying out a new morning coffee happy hour that will run weekdays from 6:30am – 9:00am. Grab a coffee for just a buck and espresso drinks are half off during this time. The Odyssey Theatre is holding free previews of My Sister, a smash hit at last season’s Hollywood Fringe Festival, Janet Schaphohl’s story of identical twins in pre-World War II Germany has been expanded and will receive a full production at the Odyssey Theatre. Previews will Thursday 14th (8:00pm), Friday 15th (8:00pm) just call the box office to add your name to the list, as general admission. Editor’s note: We had previously listed an Eikon Photography Sky Lantern Event in DTLA for Saturday, January 15, 2016 at 4:30pm, however it’s come to our attention that the fire marshall will be likely be taking action to prevent it from happening before it even gets started, so we suggest if you have already purchased a ticket to contact the organizer. Thai Town, Little Armenia and Korea Town are filled with great food, shops and culture. For those interested in getting to know these neighborhoods this tour is the perfect introduction. Tour includes food, transportation and more. Get more information and discount tickets via Goldstar. 15. Royce’s Arcade Warehouse Free Day! On Saturdays Royce’s Arcade Warehouse in Chatsworth opens up its doors to the public for a day of free play from 10:00am – 3:00pm. 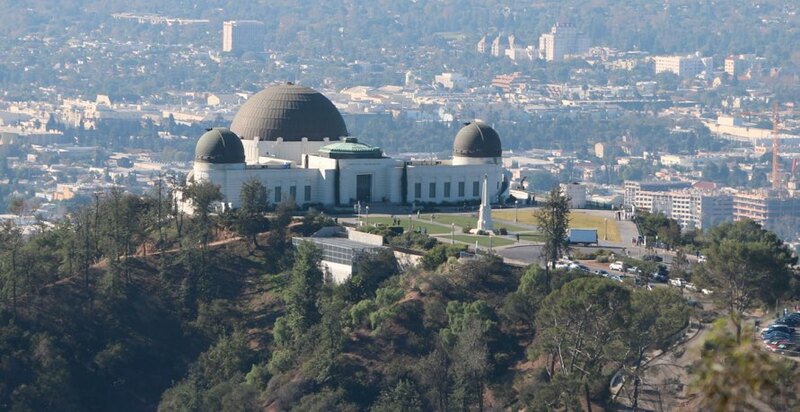 See the Sun, Moon, Planets and constellations magnified for your pleasure with the powerful telescopes at the Griffith Observatory. Their popular (and free) monthly Public Star Party happens from 2:00 pm to 9:45 pm this Saturday outside on the lawn of the Observatory. Are you an amateur brewer or maybe just a craft beer fan? Come out to a monthly bottle share event held by 38 Degrees. Discover and sip on great beers and meet some brew enthusiasts from 11:00am -4:00pm. This event is free to attend and guests should bring approximately 40-50 ounce’s worth of beer to share with others. Hollywood’s legendary El Capitan Theatre presents a special engagement of Lucasfilm “Star Wars: The Force Awakens” December 18, 2015 through February 7, 2016. Before the movie, El Capitan guests will be treated to an all-new Laser Lightsaber Curtain Show and can explore El Capitan’s exclusive display of costumes and props from the movie. Get more information and discount tickets on select days this week via Goldstar. Named, Haunts of a Dirty Old Man is a fascinating four-hour guided bus tour by the folks at Esoteric Bus Adventures taking you to Charles Bukowski’s favorite L.A. haunts. See where the literary giant lived, worked and drank, visit the DTLA postal sorting facility he writes about in Post Office, the De Longpre apartment he once lived in, The Pink Elephant liquor store and much more. Get more information and discount tickets via Goldstar. The Lunar New Year is just around the corner so celebrate Asian American culture this weekend at the Asian American Expo in Pomona! Admission is just $11 and grants you access to all vendor booths, merchandise, accessories, food courts, entertainment, live music, dance performances, a parade, petting zoo, and much more. Broadway Sings Disney is a powerhouse concert developed from the Walt Disney catalog’s 80-plus years of magical music. From Steamboat Willie, to Frozen’s “Let It Go,” Broadway Sings Disney is part of SiriusXM podcast, On Broadway’s Supper Club Live, a monthly broadcast sung by some of the brightest of stage and screen. Happening at the Rockwell Table & Stage. Get more information and discount tickets via Goldstar. Brooklyn-born craft market Artists & Fleas takes place every third weekend of the month along Mateo St (between 6th and 7th St) in DTLA from 11:00am – 5:00pm. The market features locally made art, fashion, vintage wares, vinyl, edibles and beyond. Feeling hungry after a full day of shopping? No need to worry there’s a “feed lot” that features five LA-based food trucks; admission is free. Grill ‘Em All’s Alhambra turns three this weekend, and they plan to celebrate all day. Guest will have a chance to order the OG Blue Cheer burger and free birthday cake and a 3rd anniversary pin will be given out for all purchases. There will be a live DJ playing metal hits, and free black metal face painting in the evening too. Discover some of the oldest and newest sites in DTLA as you figure out cryptic clues and solve brainteasing puzzles in this urban adventure through L.A.’s past, present and future. The challenge will take you through some of the city’s most historic neighborhoods from the heart of downtown’s historic core to the “village” of Little Tokyo. Get more information and discount tickets via Goldstar. Head to Shoreline Village in Long Beach this weekend for games, bluegrass music, arts & crafts, live entertainment, dancing, magic, and more at the 2nd Annual Buckaroo Days happening Saturday and Sunday. This event is free and open to all ages. Join local talented artists and artisans for a day of live music, art, food and handmade products at the first Sound Saturday of 2016. This is a free event. Happening 12:00pm – 8:00pm. By popular demand, DEBATE DEBATE is back for its second installment at the Theater at the Ace Hotel this Sunday. A panel of LA’s top comedians will take the stage to give live commentary (via projected text on screen) during the Democratic National Debate, with live comedy during commercial breaks. The goal is to engage young voters and encourage them to vote this election…by making democracy fun! The lineup this time is: Lucas Bros, Guy Brannum, James Adomian, Karl Hess, Rob Fee and a very secret special guest. Drawing from the Masters at The Getty Center is a free class offered on the first and third Sundays of every month and provides participants general sketching guidance via a rotating list of guests artists. This smash hit straight from London’s West End, makes’s it’s U.S. debut at The Broad Stage in Santa Monica. See George Orwell’s novel come to life through radical staging that blurs the line between the past and present and what’s fiction and reality. Keep in mind our friends at Goldstar have some discount ticketing options for this performance throughout the month of January (while supplies last). As part of a monthly Chance to Dance Community Day series the Los Angeles Ballet Center is holding a day of free classes this Sunday. This month’s theme is A Chance to Dance Fitness Fair “New Year, New You.” Partake in a pilates class, a youth and pro ballet session, to even hip hop. The day concludes with an interactive seminar titled “Behind the Ballet” lead by the ballet’s physical therapist. The event is totally free and open to the public. Wh y not spend a day at the races with a package that includes admission to the races, box seating and a racing program, along with a pint of local craft beer from the Farriers bar. Get more info and discounted tickets via Goldstar. Quentin Tarantino is a master in elaborate costumes and his latest film, The Hateful Eight, is no exception. Costumes from the film will be on view in the Imagination Gallery of The Autry. Designed by Courtney Hoffman and on loan from Cine-Manic Productions, Inc., the display features costumes worn by Samuel L. Jackson, Kurt Russell and Jennifer Jason Leigh.